Synopsis: When Amelia Tate is cast to play the Audrey Hepburn role in a remake of Roman Holiday, she feels as if all her dreams have come true. She has a handsome boyfriend, is portraying her idol in a major motion picture, and gets to live in beautiful, Italian city of Rome for the next two months. My take: Rome in Love is the story of Amelia, an American actress in her first role and Phillip, an American writer trying to make it on his own instead of taking a boring job in his family’s Wall Street business. With her detailed descriptions of setting, fashion, and characters Anita Hughes made me feel like I was watching a movie. My one quibble was the feeling that the intimate scenes between the main characters seemed to have no chemistry – as if they were inserted as an afterthought. I’d rather they’d been alluded to because they seemed oddly detached from the overall tone of the novel. Despite my quibble I enjoyed the basic story and the parallel Audrey Hepburn storyline. I also liked the secondary characters. Phillip’s photographer friend and Amelia’s new friend, Princess Sophie added comic relief. 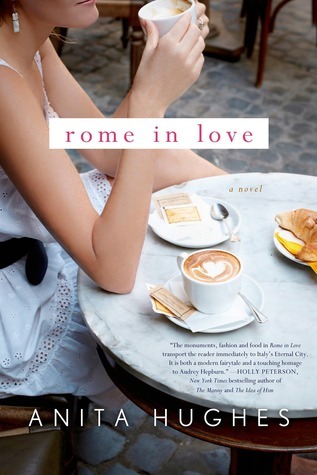 If you’re a fan of the film Roman Holiday, Audrey Hepburn, and the Rome setting you’ll probably enjoy Rome in Love. It’s a breezy, romantic tale perfect for the beach. I like intimate scenes that are subtle too. Still, the book sounds good. I found it on Amazon Prime and watched it soon after finishing the book. Hadn’t seen it in years, not sure it still holds up. I think I’d enjoy this book, and now I want to re watch Roman Holiday. I’d be interested in what you think of the film. I watched it after reading this book and remember enjoying it more the first time (decades ago). It was fun to see Gregory Peck, Audrey Hepburn and Eddie Albert though. This sounds as though it would be fun to read! I love the sound of this one…the setting grabs me. However, too bad about the lack of chemistry! Thanks for sharing. It had a light of high points despite the lack of chemistry between the two main characters. I read and enjoyed this one as well though I do agree about the physical scenes. There’s something a little detached about them I think. Ever since I read this I’ve been really wanting to rewatch Roman Holiday! I watched the film after reading the book. I’d be interested in your thoughts about the film. It had been a long time since I’d watched it. Mary, thanks for your honest review. It sounds good, but I do wonder about the lack of chemistry. Thanks, Susan. Maybe it’s just me so if you like the synopsis you might want to read more reviews. There were many readers at Goodreads who loved it.